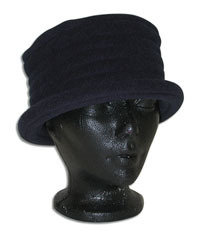 Stylish cotton knit beret, 10.5 inch diameter. Worn by men and women. Available size: One size fits most. Available colors: Black, Blue Heather, White, Navy, Natural, Brown and Sandstone. 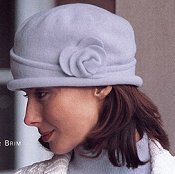 Stylish cotton knit beret, 11.5 inch diameter. Worn by men and women. One size fits most. Available colors: Black, Blue Heather, White, Navy, Natural, Brown and Sandstone. A feminine cotton knit beret, featuring the pointelle stitch with a hand crocheted look. Practical to wear all year around. Unique style that looks great on. One size fits most. Available colors are Black, White, Navy, Blue Heather, Blue Sky, Natural, and Sandstone. Need just a hint of dressed-up-for-the-opera tuxedo ruffle for casual yet chic summer events? This is the hat for you! The topper style fits in with the formal dress theme, so always show off in high-class style. Available colors: Black, Natural, Red and White. This is the most comfortable ball cap around! The cotton knit body gives and stretches where you need it to and it’s lightweight and breathable. 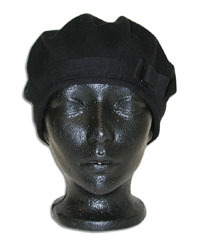 The relaxed cap hugs your head just like a beanie with the added bonus of the bill/visor. The soft cotton knit is great for when out in the sun on hot summer days. Available colors: Black, Heather Blue, Nutmeg Brown and Red. This is a hat that appeals to everyone, from individuals who aren’t into to flowers to those who are into fashion trends. 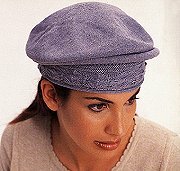 Pull the hat right above the eyes to create the sweetheart look. The asymmetrical hat band wraps around the crown and ends in v-shaped point, where the tonal rose sits. Available colors: Black, Light Blue, Mystic Mauve, Rose and Wine. This hat definitely stand out amongst the rest of the Parkhurst line because of the design in the crown. The 'ribbed' crown looks like the ribs in an accordian. 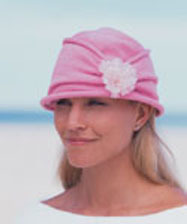 These parallel lines add texture to the comfortable soft cotton knit hat. Available colors: Black, Natural, Navy, Red, Sandstone and White.